When I first heard they were making a new Jumanji movie, I was skeptical. Not because I'm a die hard Jumanji fan. I saw the original when I was a kid, but I haven't seen it in a long time. In fact, I don't really even remember that much about it. My skepticism more came from a place of wondering why they needed to do this at all? I didn't see the value in going back to this world. 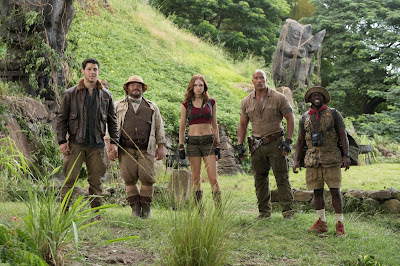 But then they brought on Dwayne Johnson, Kevin Hart, Jack Black, and Karen Gillan. Bringing together talent like that certainly caught my interest, but it was the trailers that truly got me on board. It looked like an insanely fun time at the movies, bringing out the best from these comedic superstars. It looked funny, action-packed, and entertaining, and that's all I was looking for. And it turns out to be all of those things. Jumanji: Welcome to the Jungle certainly isn't trying to be an Oscar contender, but what it lacks in depth it makes up for in sheer entertainment value. Four teenagers stuck in detention are whisked away into the video game world of Jumanji, and must fight for their lives to solve the game in order to make it back home. All of the performers are fantastic in this film, and are perfect fits for their roles. The group dynamics are excellent, and they all have hilarious back-and-forths with each other. Some of my favorite moments in the movie are when everyone is simply standing around talking. Dwayne Johnson really shows his comedic talents here. While he does have a few scenes where he gets to show off his action chops, most of his role is comedy-heavy, and he delivers on it. Kevin Hart plays the same character he always plays, and more times than not it annoys me, but for whatever reason here it works. Maybe it's his chemistry with the other actors, but he's hysterical in this movie. I'm not a huge fan of Karen Gillan's character of Nebula in the Guardians of the Galaxy films, so I wasn't sure how she was going to be in this. But she delivers as well. Not only does she nail the action beats (and she has some of the best in the whole movie), but she also has some great comedic moments, comedy that I didn't know she could pull off as well as she did. But the true star of this movie is Jack Black. I thought he was hysterical in the trailer, but I was afraid that the concept of him actually being a teenage girl would get old and annoying quick, but it doesn't. Black is perfect for this role, and nails every comedic moment he's given. They are all fantastic together, and it makes for some great entertainment. This movie makes fun of a lot of video game cliches, from their storylines to how they technically operate. There is a lot of creativity gone into making each tiny part of this film fall in line with how an actual video game functions, and it makes it all the more fun to watch. I'm not a huge gamer myself, but it was still appealing to me in this sense. It also allows you to forgive the dull story, underdeveloped side characters, and evil-for-the-sake-of-being-evil villain, because those are all qualities of a video game. It's an ingenious ploy on the movie's part to rationalize the weaker elements of the film so that they can then instead focus most of the time on the group's dynamic, which is the more interesting aspect of the two. 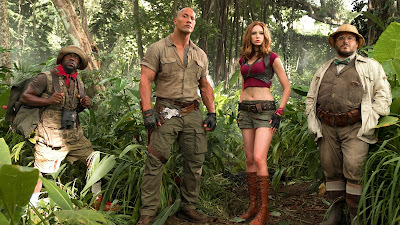 In that sense, much of what I would normally classify as negatives are simply part of the video game commentary Jumanji adopts, and that is really smart on the filmmaker's end. The movie would not have worked nearly as well as it does if you weren't able to buy into the kids behind the avatars in the beginning. The filmmakers could have brushed right past the kids in order to get into the actual story, but they do a really good job of giving these kids distinct personalities and character traits, and make them relatable enough so that you care about what happens to them. And the movie doesn't lose sight that it is actually kids behind these characters. Dwayne Johnson never gets lost in simply being Dwayne Johnson; everything he says and does is what Spencer (Alex Wolff) would say and do, and that makes it even stronger of a film. Lesser movies may have simply said, "To hell with that! This is a throwaway action movie. No one's going to care about a sense of continuity!" But because the filmmakers care, it makes for some great comedic beats, and a story you can get invested in. Like I said before, a lot of what I would typically state as negatives are remedied because they are qualities of video games, which the movie is making fun of. So they ultimately work. However, there are still a few things that don't. The main one is with Kevin Hart's character. In the video game world of Jumanji, he's Kevin Hart, in terms of his mannerisms. He acts the exact same way Kevin Hart acts in all of his other movies. And I already said before that that shtick actually really works for me in this particular film. But Fridge (Ser'Darius Blain), the guy Kevin Hart actually is, does not act like Kevin Hart in the real world. In Jumanji, every avatar acts in the same fashion that their real life counterparts act in. Dwayne Johnson carries over specific qualities of Spencer, as does Jack Black with Bethany (Madison Iseman) and Karen Gillan with Martha (Morgan Turner). However, Fridge does not act in the way that Hart acts once in Jumanji. The two share no comparison in terms of their personality. I don't blame either actor for this; this is merely an oversight on the filmmaker's end. But it is still an issue that bothers me nonetheless. There are also some brief pacing issues, and the film could have had about ten minutes shaven off. But these are rather minor issues in the larger scheme of things that did little to take away from my enjoyment of this movie. 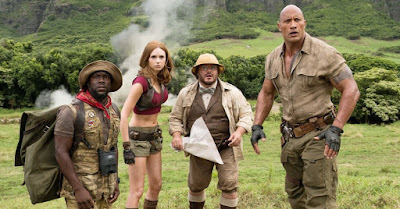 Overall, Jumanji: Welcome to the Jungle is one of the funniest movies of 2017, and is one of the best times I've had in the theaters this year. The cast all around is excellent, and are all perfect fits for their roles. But Jack Black is the highlight of the movie. He has a certain scene involving his using the bathroom that I laughed harder at than I've laughed at any other scene in a movie this year. It's comedic gold! The action sequences are spectacular, the comedy hits on every level, and the performers across the board deliver. It doesn't have much story depth, supporting character development or a rather well-fleshed out villain, but these become nonissues when viewed through the lens of it being a commentary on video games. Since those are issues common to many video games, you are able to forgive them. The film does have a minor issue, in that Kevin Hart's human counterpart does not act like how he ultimately acts in the video game world. About ten minutes also could have been shaven off in order to make it a leaner movie. But in the end, Jumanji: Welcome to the Jungle delivers consistently on laughs, action spectacle, and entertainment, enough so for me to walk away from the theater very satisfied. What do you think? 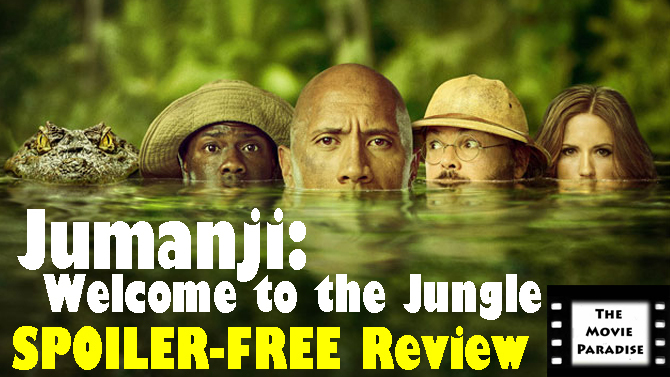 Have you seen Jumanji: Welcome to the Jungle? If not, are you planning on seeing it? Leave your (spoiler-free) thoughts in the comments section below.